Dutch architect, urban planner and furniture designer, Mart Stam strode into the world of architecture at just 21. His style of design has been classified as New Objectivity, an art movement formed against Expressionism during the German depression in 1920’s. However, in 1920, Stam was imprisoned for six months for refusing to serve in the military. 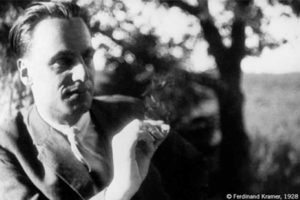 In 1928 and 1929 he worked as an architect in Frankfurt, where he helped build the Hellerhof housing estate. 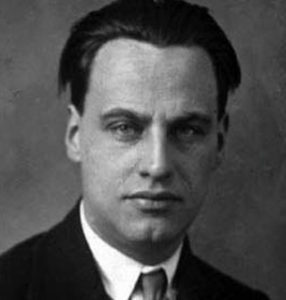 In that period, he was a guest lecturer at the Bauhaus, teaching elementary construction theory and urban planning. In 1939 he assumed the top position at the Academy of Arts and Crafts in Amsterdam, and in 1950 he was named director of the Conservatory for Applied Art in Berlin-Weißensee. He returned to Amsterdam in 1953 but emigrated with his wife to Switzerland in 1977 and withdrew from public view. He did in 1986 in Zurich. 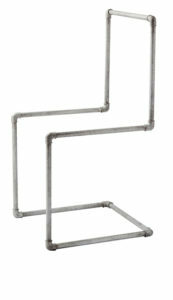 After moving to Berlin, Stam devised a steel-tubing cantilever chair, using lengths of standard gas pipe and standard pipe joint fittings. Inspired by a cantilever tubular steel seat seen installed in a 1926 Tatra T12 two-door saloon car, he developed the gas pipe chair, a chair which made history. 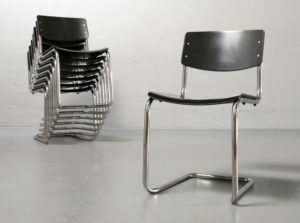 During the Die Wohnung exhibition, he expounded his first set of cantilever chairs, which will create a completely new kind of chairs.From that moment, his style has developed more and more, creating more elaborate models such as the s33 and s43 chair (1926) which were created by using curved steel tubes. This was considered the material of the future in the modernist era and it revolutionized the modern furniture due to the strength of the material and the structure. 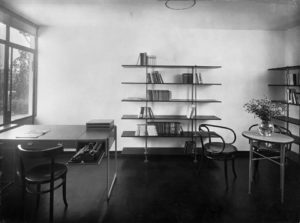 On the rights of the project there was also a dispute between Stam and Marcel Breuer, which however was won by the first, whose chairs will be put into production for the first time by Thonet in 1932. 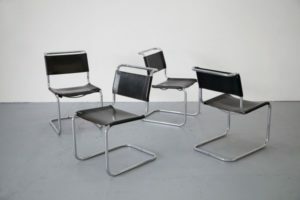 Stam was extraordinarily well-connected, and his career intersects with important moments in the history of 20th-century European architecture, including chair design at the Bauhaus, the Weissenhof Estate. It is a housing estate built for exhibition in Stuttgart in 1927. It was an international showcase of what later became known as the International style of modern architecture. The permanent housing project put him in the company of Le Corbusier, Peter Behrens, Bruno Taut, Hans Poelzig, and Walter Gropius, and the exhibition had as many as 20,000 visitors a day. Mart Stam is undoubtedly best known for his S43 cantilever chair. With this S43 Chair, he combined tubular steel with molded plywood to strip down the form of his original 1927 cantilevered tubular steel chair. As said before, Stam’s personality was shaped by obstinance, bravery, idealism and outspokenness. His style of design has been classified as New Objectivity, an art movement that arose as a reaction against Expressionism during the German depression in the 1920s. Stam’s style is characterized by clean lines, straightforward, functionally minded approach to construction. 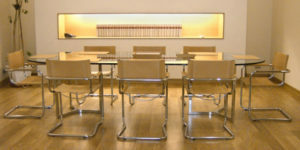 His prototype revolutionized modern furniture design. At the beginning of his career, Stam was not yet interested in the bending effect obtained with cold-bent steel tubes, but his attention was captured by simple design without ornaments.